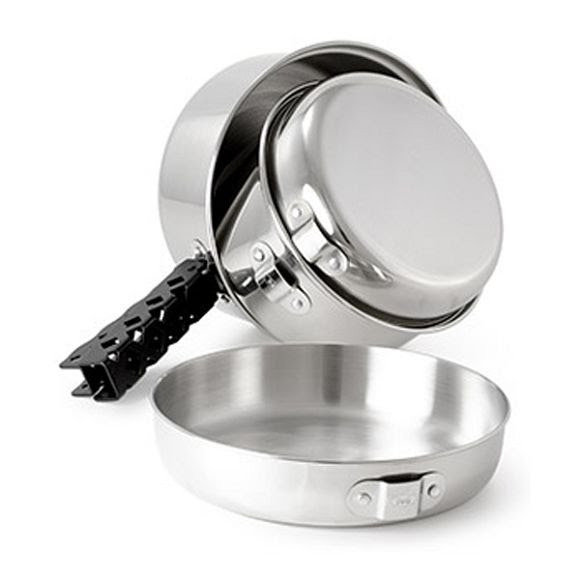 Quality, durability, functionality--all these words describe GSI Outdoors Stainless Cookset. The high grade stainless steel maintains the good taste of food and adds none of its own while being exceptionally easy to clean. The entire set is relatively lightweight, perfect for backpackers and campers. The DiamondBack Gripper provides an excellent utility tool that helps keep bulk down. Quality, durability, functionality--all these words describe GSI Outdoors Stainless Cookset. The high grade stainless steel maintains the good taste of food and adds none of its own while being exceptionally easy to clean. The entire set is relatively lightweight, perfect for backpackers and campers. The DiamondBack Gripper provides an excellent utility tool that helps keep bulk down. Everything you need to cook up a storm is right here. Dimensions (packed) 7.7" x 7.7" x 4.8"